Courmayeur may have a reputation for its legendary restaurants and fur-clad weekending Milanese, but it also has some amazing off-piste accessed from the top of the ski area and the Skyway cable car. As Editor Watts went to research the ski area of Courmayeur, I went to explore one of the most famous off-piste runs in the world, the Vallée Blanche. This run is a stunning adventure that can start from the Italian side at Punta Helbronner or from the top of the Aiguille du Midi on the Chamonix side. The run used to consistently end in Chamonix, a distance of 25km. But now it is only on rare occasions in exceptional snow conditions that you can ski all the way down. Now the run usually ends at a staircase with more than 400 steps (quite a challenge carrying skis) that leads to a gondola that goes to the station at Montenvers. This still gives you a run of 12km among giant seracs and stunning mountain scenery, with Mont Blanc looming above. The day I skied it was a beautiful blue sky day but freezing (-19C with a wind factor up to -31C). 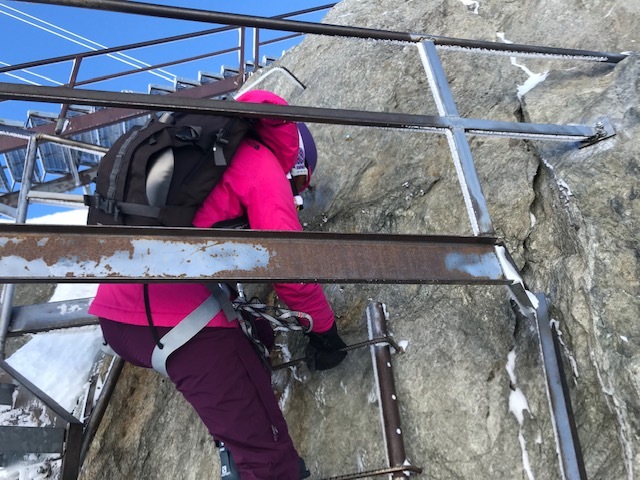 I’d been so obsessed kitting myself out with my warmest clothes, avalanche transceiver, shovel and probe that I’d forgotten that the new two-stage, state-of-the-art revolving cable car known as the Skyway Monte Bianco whisks you up to Punta Helbronner at 3466m in no time at all. It’s an extraordinary engineering feat and so luxurious you are almost ensconced in a false sense of security, forgetting that outside are some very serious high altitude mountains. 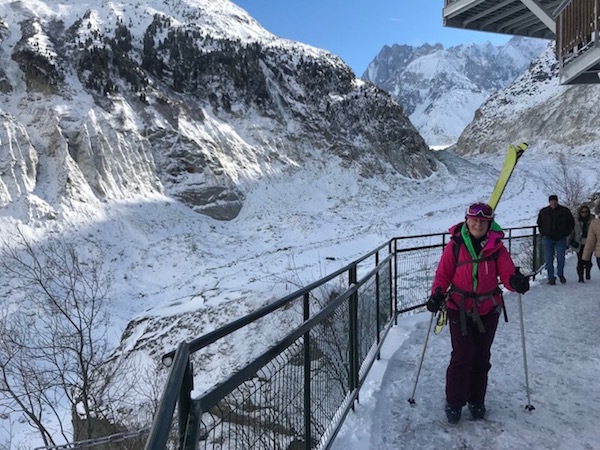 I was lucky to have a fabulous guide, Marco Tamponi, who kitted me out with the obligatory harness (a safety measure for skiing on a glacier) as we finished our coffees in the café admiring the 360-degree views and watching the wind whip up clouds around the snowy dome of Mont Blanc. Before exiting the building there’s a machine that checks your avalanche transceiver is transmitting and then you open the door and whoosh, the full force of the bitter weather outside rushes in. There are several routes you can take. The most popular is the classic Vallée Blanche which confident intermediate skiers can do. But you’ll need to have a head for heights — particularly because the journey starts by walking along a steel platform and then down some steep metal stairs. You then have to climb down a fixed ladder and walk to the Col Flambeaux. The wind was vicious and had whipped up the terrain into waves of “sastrugi”. It felt like crossing the Arctic. I’ve done the Vallée Blanche before, but later in the season and it has always been crowded. This time it was wild, untamed and empty. Weaving through the sparkling turquoise ice, it was like gently floating down a river. Midway down is the Refuge Requin (shark) but we stayed high on the Italian side following the glacier. Poor snow cover meant we had to take our skis off to walk to the start of the staircase leading up to the railway station. Initially a short gondola was built to carry passengers down to the ice caves or up to the station. Since then more and more stairs have had to be built to bridge the shortfall between the shrinking glacier and the station. Now there are over 400 steps, which when carrying skis is hard work! From the station, the train takes you to Chamonix and then it’s a 15-minute walk to the bus station, where you can get a bus through the Mont Blanc tunnel back to Courmayeur. The next day I tried another off-piste route down the Toula glacier. This is also reached from Punta Helbronner but skiing down the south side. This is a serious descent all the way to Val Veny in good snow conditions. When there isn’t enough snow to make the whole descent you can ski to the mid-station at Pavillon. For this adventure I was lucky to have a highly respected guide Rudy Buccella, author of the off-piste book Courmayeur Mont Blanc Freeride, who has been on many expeditions to the Himalayas and most recently Patagonia. Like Marco, Rudy is a member of the Courmayeur Mountain Guide Society. Sadly the snow conditions were challenging, to put it mildly. There are several routes down this side including the famous Mabrée couloir which ends in Val Ferret. Our route took us to the top of the Col de Toula where a series of metal staircases lead down a sheer rock face. Last year the last stairs did not reach the snow so you had to be roped down but in the summer an additional staircase was added. Even so it requires certain aptitude to click into your skis on a sheer mountain face, particularly when it’s icy. The run started with a steep pitch which was quite icy so Rudy tried to find some snow that hadn’t been whipped into icy waves. On a powder day this would be pure joy but the day we did it required great concentration and an ability to ski breakable crust! But it was still an exciting high-altitude adventure that justly deserved a long, cool beer when we reached the Pavillon cable car.